Remember those "Where's Waldo?" pictures? Here's a pic of all the Craftsy Instructors and some Craftsy team members I was hanging out with this past weekend. Can you find me? I've been a bit quiet the last few days mainly due to leaving my laptop cord at my friend's house in Charlotte. Severe rationing has been enacted as I wait for it to arrive in the mail. 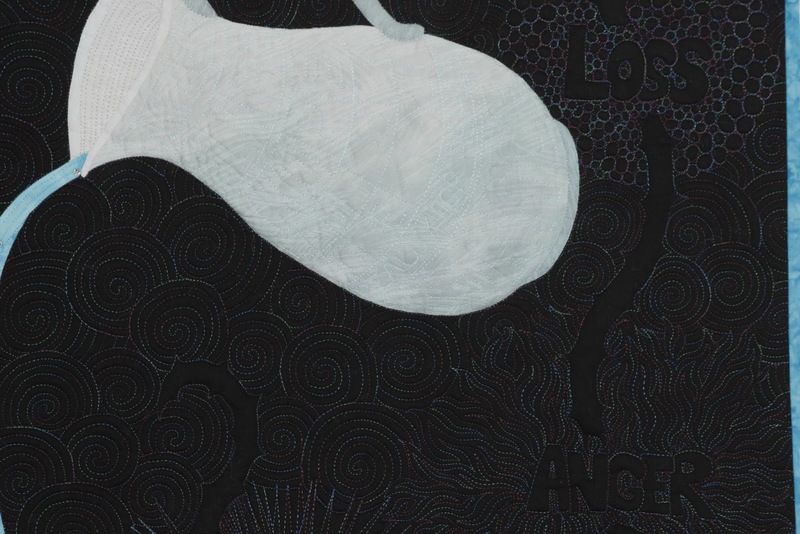 Could be worse: I could have left it somewhere and lost it forever. Those cords aren't cheap. Even more wonderful was spending a few precious hours with my quilting BFF instead of sleeping/stewing at the Charlotte airport while waiting for my flight home to be rescheduled for the next day. 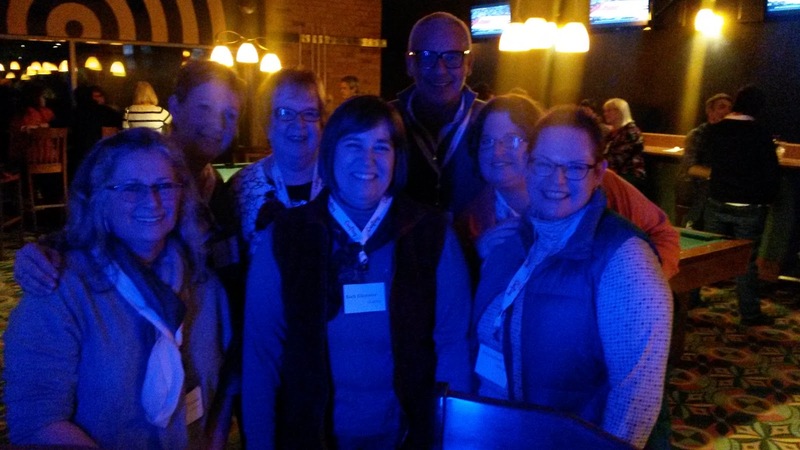 While my family is snowed in with about 12 inches of snow in Virginia, I am out in Denver, nearly snow free, at a gathering of Craftsy Instructors.I am also about 300 feet away from where the Denver Broncos are sleeping before the big game. They're just past a polite guard down the hall from my hotel room. I haven't seen them though and other than guessing from their size I wouldn't recognize them anyway. Instead, I have been meeting quilting celebrities, learning about using Facebook, editing photos for better pictures of my work, and getting to know some really fabulous folk. 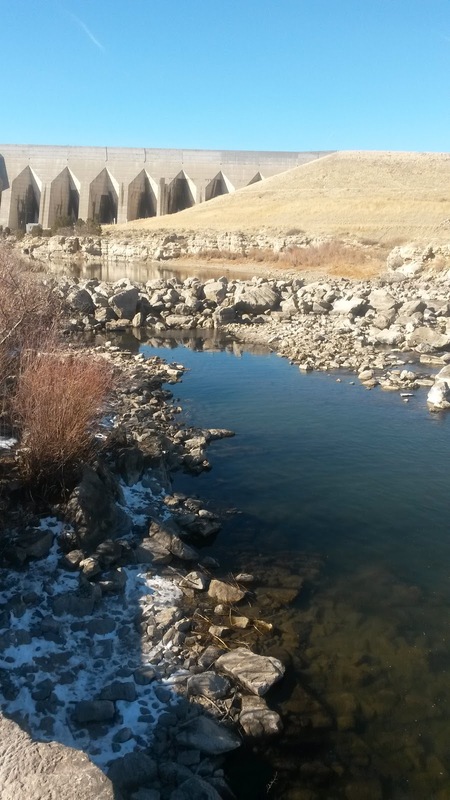 To sort of compensate for that awful picture, here's a shot of the Arkansas river and dam near my parents' home in Pueblo CO. I'll be back soon with better pics and more quilty goodness. There's no place like home, even if I am having a good trip. If your in the big snow fall, stay warm and safe. As the mid-Atlantic area of the US braces for a huge snow storm, I hopped a plane and ran off! Actually, I'm visiting my parents in Pueblo Colorado, where ironically there's very little snow. Then I will be attending a special conference for Craftsy instructors. I'm looking forward to meeting a whole bunch of talented folks. I showed the back of my Poured Out 2 quilt a few days ago and I've gotten several requests to see the front from some of my newer readers. This quilt is incredibly hard to photograph! This was a very personal quilt for me, done to process the emotional roller coaster I was on while my husband had cancer and I was struggling with a newborn who would never sleep. Thankfully he's cancer free and that baby finally learned to sleep through the night and is now a sweet 6 year old. If you are in the path of the storm, I wish you warmth and safety. 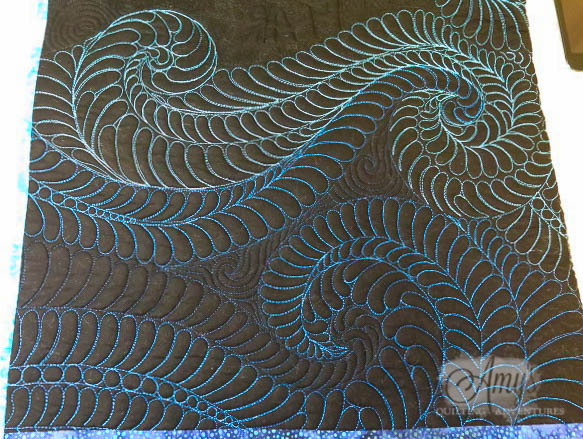 I can't say it enough.....a smooth slippery surface is your biggest asset when it comes to free motion quilting! 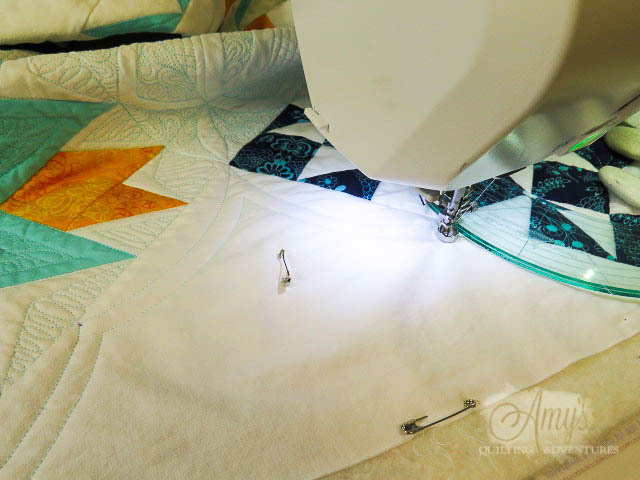 If you can't move your project smoothly, your quilting will have a jerky, uneven look and your stitch length will be inconsistent. 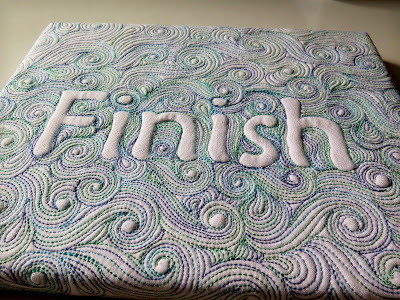 Plus, you will be a tense and frustrated quilter! Putting down a slippery mat of some sort is super seriously helpful! It not only does the obvious of being slippery, but it also covers any cracks between machine and table plus smooths out any bumps on the bed of the machine. These cracks, bumps, and grooves can catch basting pins, feel odd under your hands, cause friction, and cause rulers to rock. Anytime I have been in a rush to go from regular sewing to free motion sewing and back, I've regretted it if I skip the step of putting down the slider. For years I've used the Supreme Slider mat and I've loved it. It seems a bit pricey, especially if you get the queen sized mat for the bigger machines. But I've always felt it was worth the cost. I've heard tell of quilters using some nonstick oven or pan liners for this purpose. I suspect my Goddess Sheet, bought for use with ironing fusible web that doesn't have a paper backing, can be used for the same purpose, but it is an ugly brown. I want a white mat. I've also heard of a similar product called the Sew Slip mat. For the last several days, I've been using the Sew Slip product. It's a smidge bigger than my queen sized Supreme Slider and about $5 cheaper. It seems like it clings better to my table than my other slider but the other one has been used more and is a bit dusty. I'd have to compare the two products in their brand new condition to really say one way or the other. The first thing that I noticed was the Sew Slip is slightly textured. This seems very counter to my expectations, but it's so slippery, that the texture doesn't seem to matter. Above is a close up of the sheet to show the slight texture. My Goddess Sheet mentioned above has a similar texture. I haven't cut a rectangle around my drop-in bobbin case cover yet. I'm going to continue to test this product and see if it holds up well around the needle hole area. I have noticed some stretching of the Supreme Slider after a lot of use. How about you? 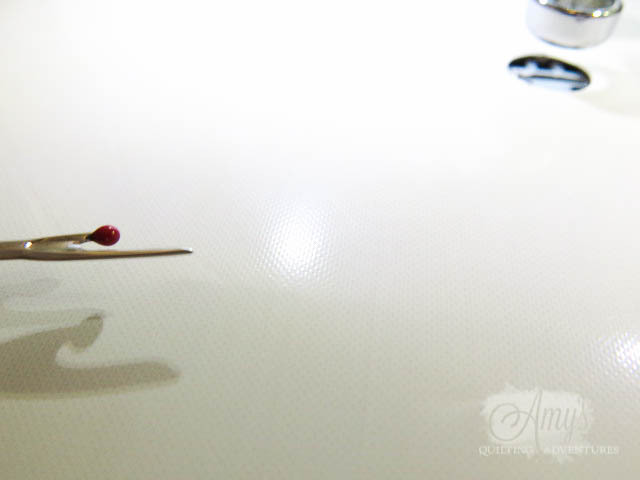 Are you using a Supreme Slider, Sew Slip, or teflon oven sheet? 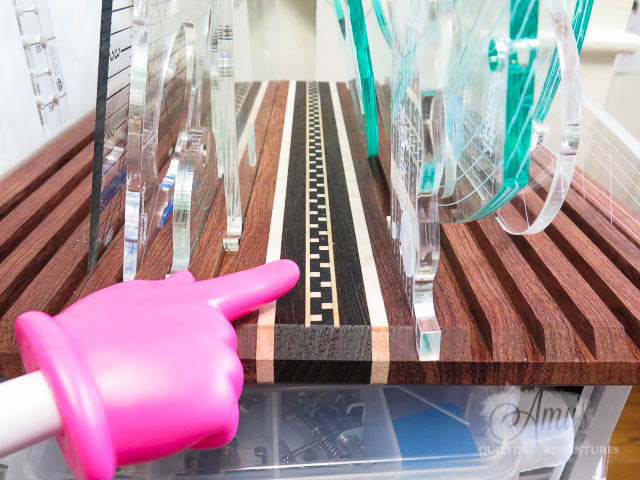 I really think something like this is necessary for free motion quilting, even if it's just a slick sheet of plastic, glossy paper, painter's tape or what have you to cover up cracks and bumps on and around the bed of the machine. Let me know what you use, if anything, on your machine? Or rather, the big rulers! I'm working whenever I can to make my ruler work sampler my first finish of the 2016. I plan on showing it at a talk I'm giving Friday, so time is short. 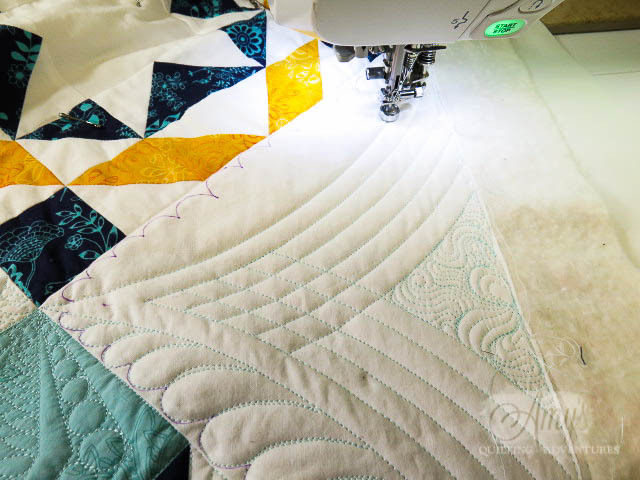 I'm using a variety of rulers as I quilt, keeping it mostly to the common sizes of rulers and some smaller as I'm keeping my focus on what your typical free motion quilter can comfortably use on their domestic or home machine. 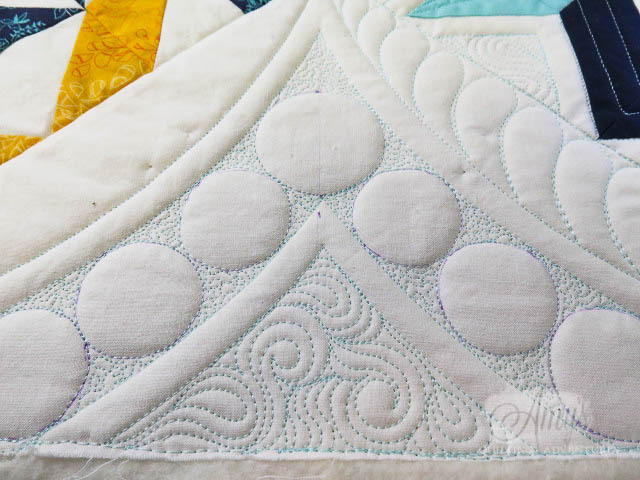 These big blank setting triangles can be intimidating with their large space to quilt. 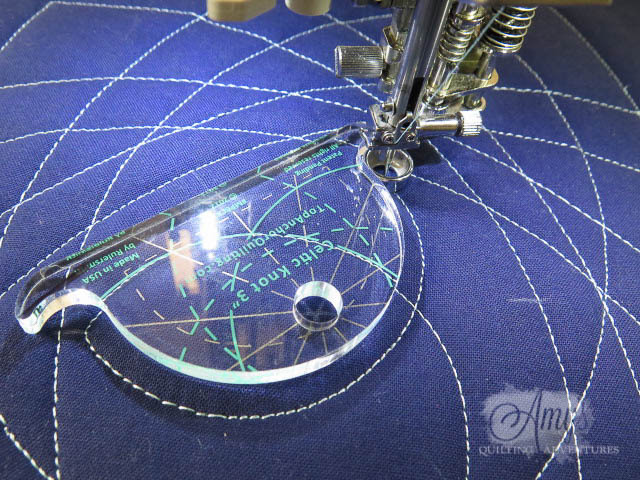 When quilting on a domestic sewing machine, this large ruler can be a little tricky to maneuver. First of all, you need a smooth flat surface as they can get tippy when going across bumps. We don't want to be rockin' in this manner when quilting. 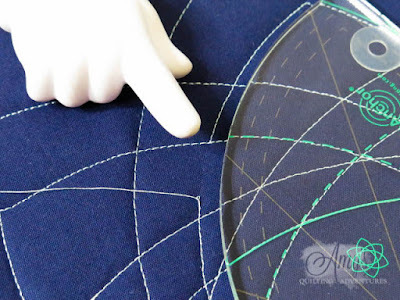 You need to orient your work so that the end of the ruler doesn't run into the machine body to the right as you stitch towards the left. 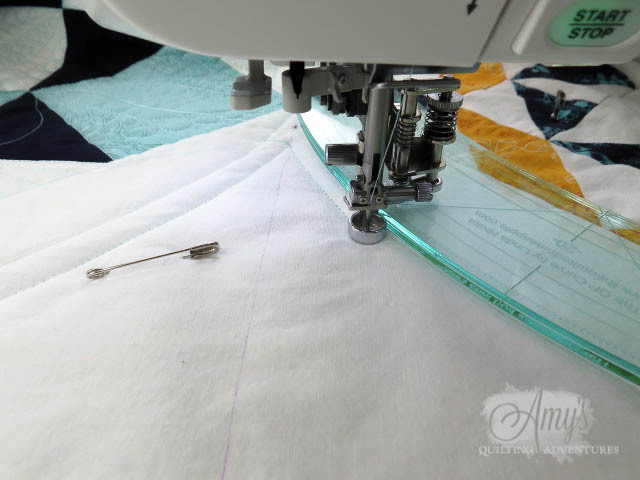 You may find that the most comfortable orientation of the ruler for stitching may leave the ruler hanging off in space while the quilt drapes down the edge of the table closest to you. 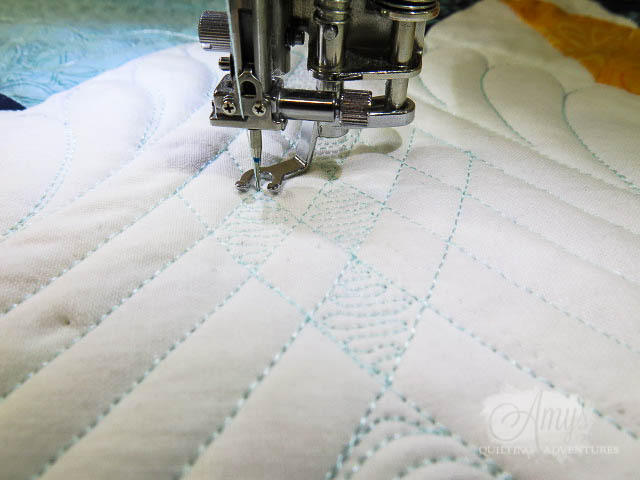 Just lift the quilt up and line it up as close as possible for the initial positioning, then let the quilt go while you begin stitching. Check it frequently to see if you need to "course correct." 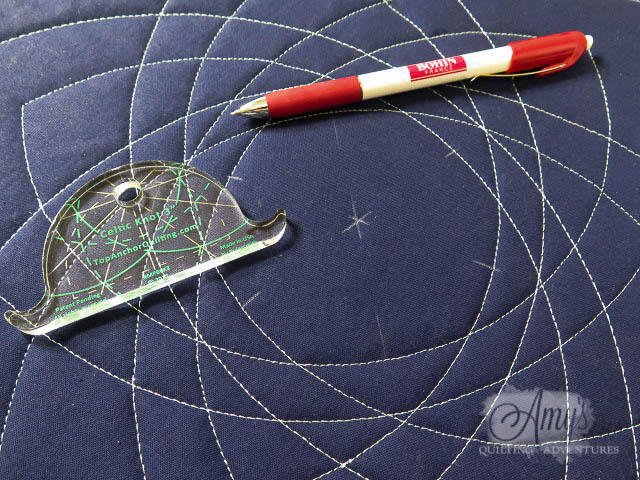 Once you've stitched about half the length of the ruler, it should be back on the table. I brought out my biggest ruler, the QPC #20 (coming to the shop soon!) for some nice curves on two setting triangles which are 12 inches on the shorter sides. Previously, I had used a smaller ruler across 2 other setting triangles of the same size. It was half the size (QPC#10) and I used it for half the distance to create a double scallop kind of design. It helps that I have an 11" throat on my machine, but you can use the larger rulers on a smaller machine too. Just use the tips above and remember that the bigger the ruler, the more likely it is to slip. I make sure my bigger rulers have some sort of non-slip product on the bottom. My favorites are the True Grips and HandiGrip Strips. More pics coming soon as well as a tutorial showing how to get feathers to come out even in repeated spaces. Have you ever set yourself some crazy deadlines with your projects? It seemed like I had plenty of time, but I've had a drastic change to my schedule and time to quilt has been hard to find. I've been meaning to write about this new set of templates for a while but just hadn't the time to do them justice. 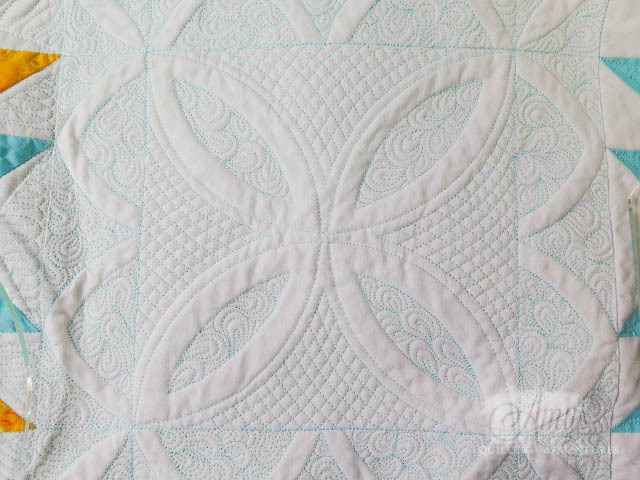 I used a prototype in my Craftsy class "Quilting with Rulers on a Home Machine" (50% off link!) 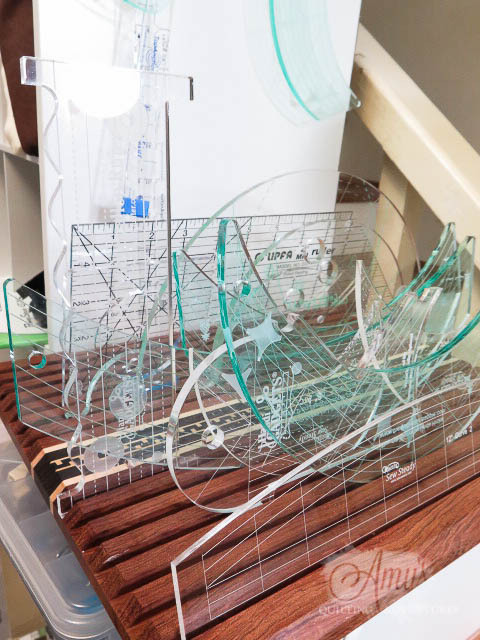 to demonstrate rotating templates and used the same template without the rotating pin for a whole block design as well. The above is pretty cool, but using the rotating feature is even more cool! And you can offset the designs, and nest them within each other too! I really like these anchor pins, they don't have pins poking up where I'm guaranteed to poke myself. 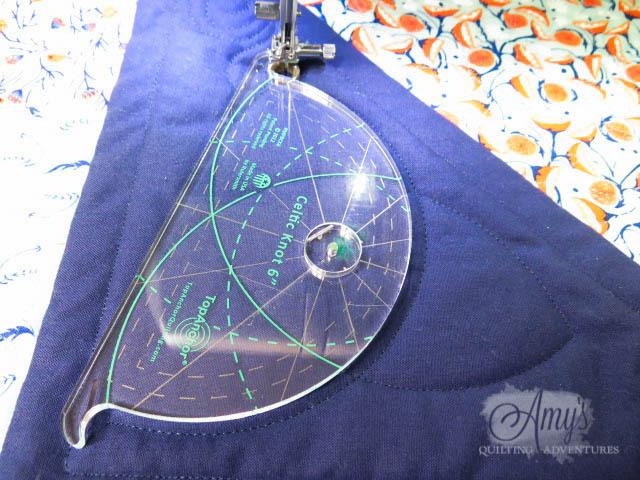 This template is a lot like a big half circle, but has a hole drilled for a special rotating pin and feet at the ends of the curve to stop your stitching. 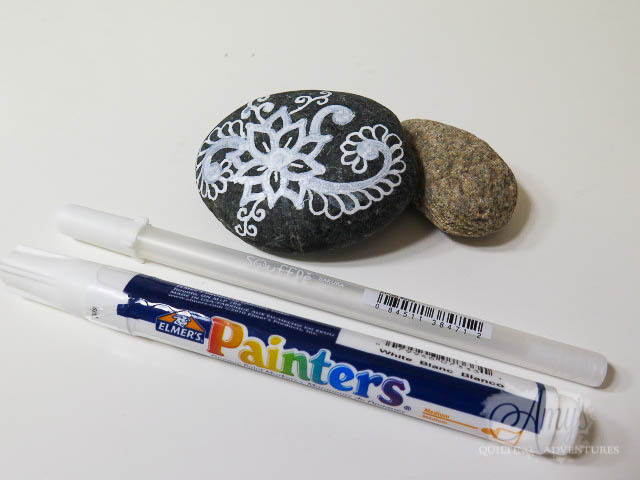 Add in some handy markings and it allows you to make a great Celtic Knot design without math or marking. There's a whole range of sizes: 12, 9, 6, and a 'pin-less' 3 inch template. The 3 inch template is cute. What is it that makes something so adorable when miniaturized? It still makes a Celtic Knot if you use the markings, but the template is too small for the special anchor post and pin. I had to use a ruler to mark reference points so I could line up this little cutie within the knot design made by the 9 and 12 inch versions. Then I used the markings for the template placement. There are metallic gold lines to help with the center and point placement. They show up really well under the lights of the sewing machine! 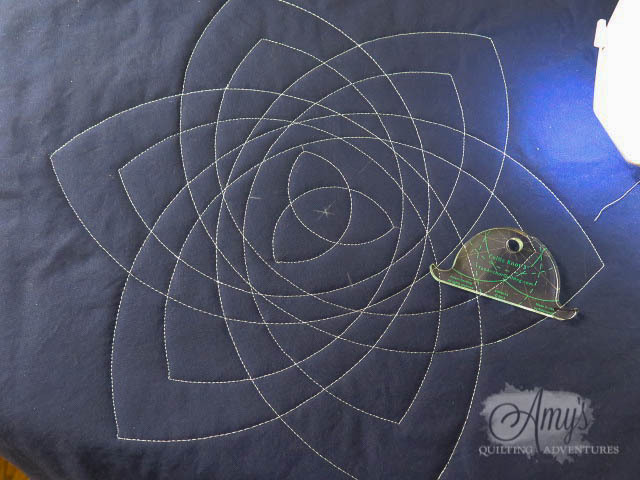 As I stitched, I used the green lines to reposition the template for the next pass of stitching. Without the anchor pin, I did need to be extra careful that the ruler didn't slip. 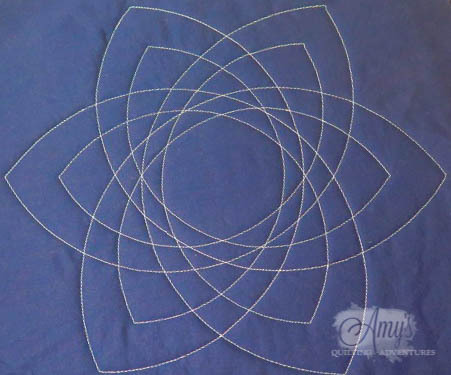 I mentioned that I used a prototype in my quilting with rulers class and I was able to suggest that 1/4 inch spacing lines should be marked around the edges of the template for greater usability when using the half circle or straight edge for other designs. This makes the template really versatile and each size makes a precise half circle in that size. It's really awesome when a manufacturer listens to input on their products. I'm now selling these Celtic Knot designs in my shop. 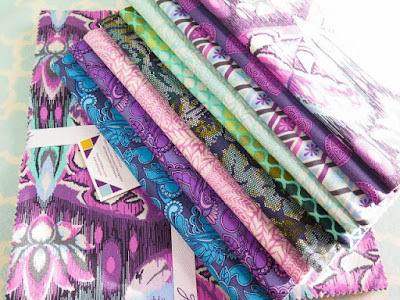 The weekend following Christmas I totally binge-watched a video series featuring fabric designer Tula Pink! This is very, very rare for me but I was completely sucked into this show which features Tula in her fabulous house and shows the process of creating one of her fabric lines, Eden. I think I want to be her when I grow up. Except that's a totally ludicrous statement as I am first of all older than her, plus I have no desire to design fabric. I'm pretty sure that she'd be horrified that someone would want to be her. She's an original and I bet she wants everyone else to be their own original too! But she and I are of a certain size and I really admire the confidence and great attitude she's got. Since her brother and mother work with her, maybe I shall aspire to be much like her mom, involved in a family business and my daughter is seriously creative! So I did the next best thing after watching the whole series.....I bought some of her fabric. Since my daughter watched several episodes, and loved the hidden animals Tula designs, some of the fabric will be in a quilt for her. I'm not quite sure what I'll do with the rest of it. It's sooooo pretty! I bought a mix of Eden and a few of her new True Colors line. 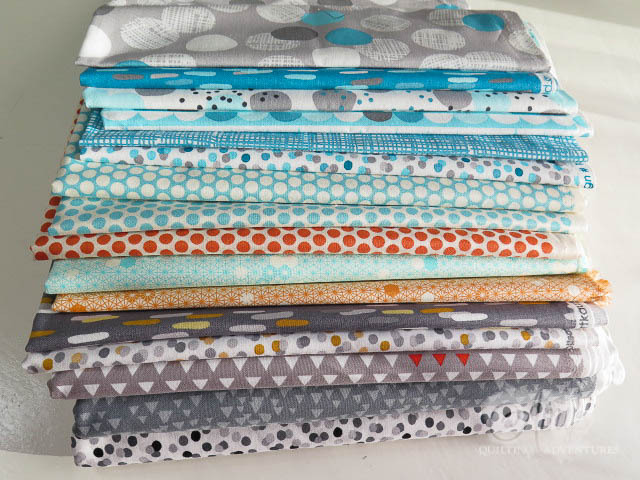 Since she's got great prints, it'll have to be something I combine with some solids so I can still let my quilting shine. While I was at it, I bought some great fabrics in colors I've been favoring lately; turquoise, grey, and a bit of orange. 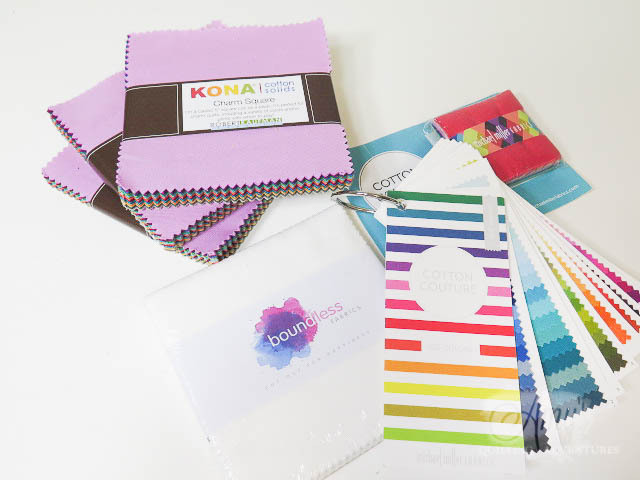 I'm thinking these fabrics combined with white or grey solids will be a ton of fun! If you are not signed up for my newsletter (Ummm...and why aren't you? ), you won't know that I'm having a ruler work link party in a little under 2 weeks! January 26th to be precise. 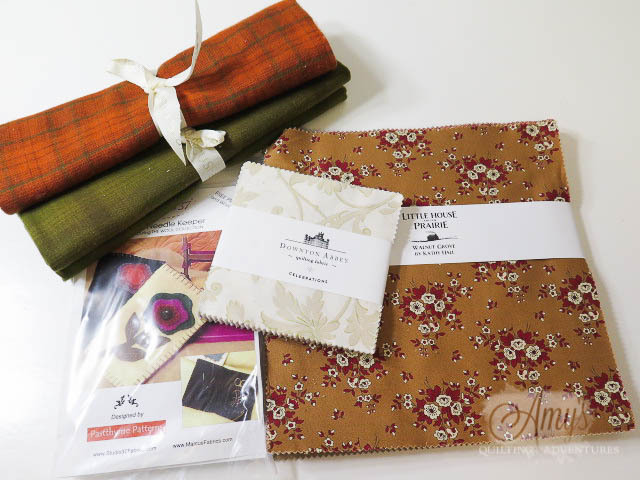 If you're a blogger, share any of your ruler work projects, samples, practice pieces, and quilts. 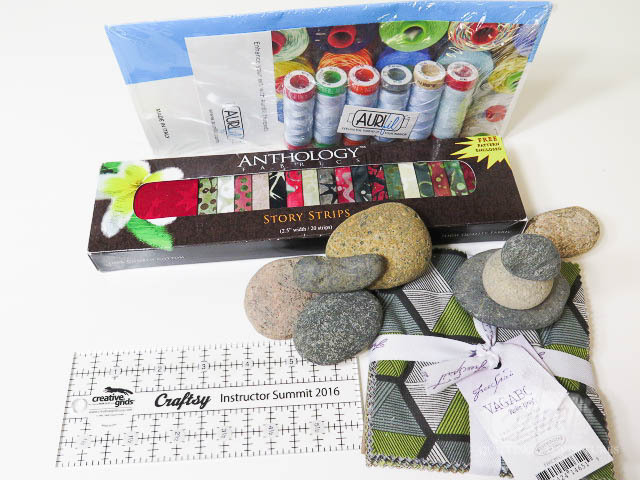 We'll all hop from link to link and feast on the quilty goodness while also inspiring and encouraging those who haven't yet tried to guide their free motion quilting with rulers. The new year always has me cleaning, organizing, and trying to get my world pulled together so I can tackle some great goals. This year is no different and I've got several big projects to tackle. Since my two biggest accomplishments of last year weren't even a glimmer this time in 2015 (My Craftsy class- Quilting with Rulers on a Home Machine (50% off link there! 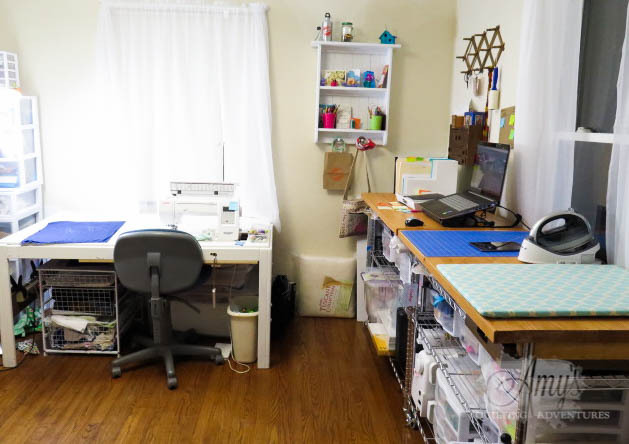 )and opening my online shop, Amy's Quilting Adventures, to sell my favorite supplies for ruler work and other tools), I'm extra motivated to prepare myself for whatever lies ahead! The first order of business was to corral my plethora of papers, pictures, and Post It notes. A quick trip to Staples and I brought home some pretty magazine holders in my favorite colors of turquoise and white to put next to my "inbox". I'm using them on their sides to hold files files and papers. (Got that idea from David Allen's Getting Things Done system) The Post Its were put into my bullet journal. Here's a video on the bullet journal. I can't ever stick with a pre-made planner, but I've gravitated to this from making to-do lists on far too many separate pieces of paper, Post-It's, and other notebooks. Here's a link to Bullet Journal Joy, who has a prettier, more artsy vibe. Both folks use some fancy notebooks, but I use a simple Walmart blank journal. 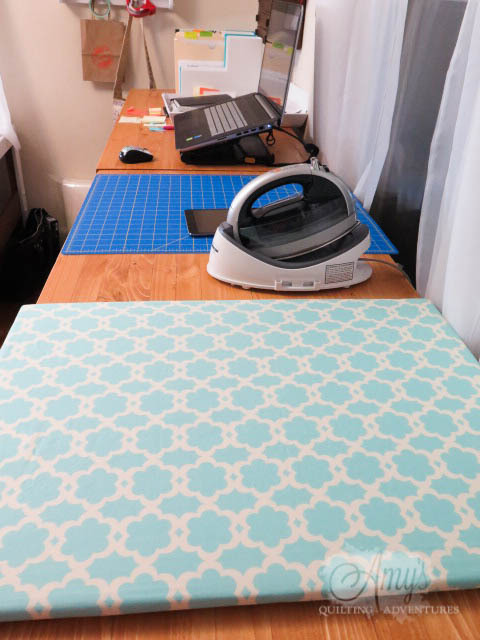 Now that the papers and computer were taking up only half of my work surface, it was time to make sure I had space to iron and cut efficiently. I had two ironing surfaces and one was too big for the space, the other was too small. I made a new ironing board out of a piece of plywood 18x22 inches, a layer of batting, and some natural twill. After using my trusty staple gun to put it all together and pulling a 3/8ths inch staple out of my finger (Yeeeouch! Big oops.) I made it a pretty cover of (What else?) turquoise and white. Now to get to my creative work! 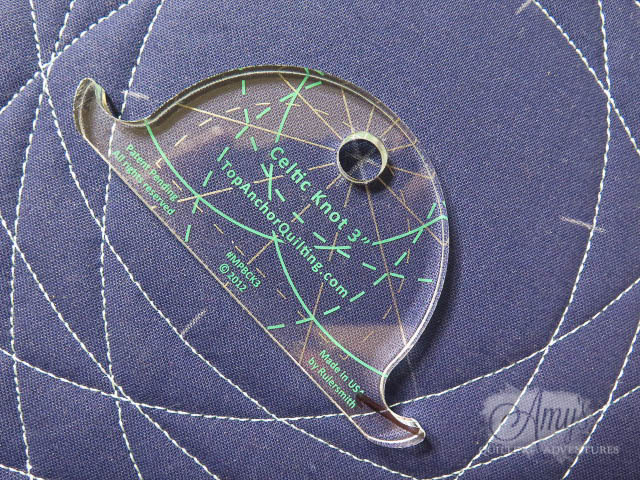 I did work on a sample using the TopAnchor Celtic Knot templates. I hope to have them available in the shop soon. Take a look see where I ran out of bobbin thread below. Less than an inch left to stitch and my bobbin comes up empty. How about you? Are you getting organized? Have some great goals for yourself too, quilty or otherwise? I am so looking forward to a brand new year! Last year was pretty awesome with my Craftsy debut and the launch of my online shop, so I am working on a plan now. Of course plans change and I'm learning to hold onto them lightly. God knows the ultimate results of the plans I make and I'm letting Him guide me as I go. I would however like a little peek into His plans for me. 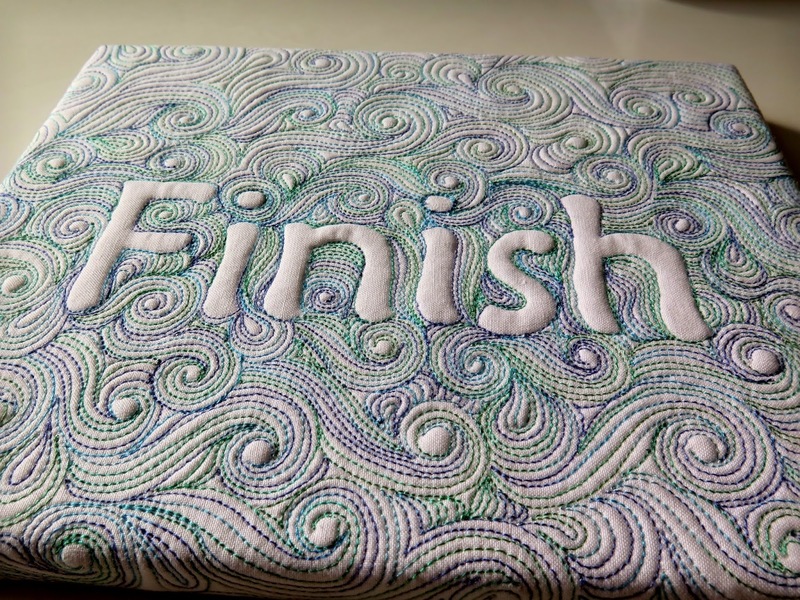 Like Leah Day, I had a word for the year last year: Finish. I'll tell you, that seems like a flop as my Ruler Work Sampler Quilt is still unfinished. But I did finish that Craftsy class and all it entails and opened my shop which wasn't even on my radar last January. I'm giving a presentation at the closest big quilt guild to me in mid-January, and I plan to have that sampler done by then. I keep a fairly low profile locally so this will be an interesting activity. I'm working on another special project and have a ton of quilts in my head just like the rest of you. I'm working on my routine to try to make sure, as Christa Watson said, "I'm a quilter who blogs, not a blogger who quilts!" That's all for now....see you next year!